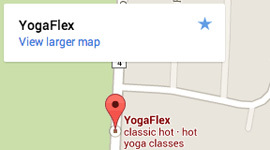 Welcome to the Yogaflex family! You have taken the first step on an incredible journey towards physical, mental and spiritual well-being. It is our mission and conscious intention to provide the highest quality yoga instruction from experienced, well trained teachers; all are Yoga Alliance (YA) certifed and each has their own teaching style. All classes are multi-level and Yogaflex instructors encourage everyone to honor their own body, practice at their own level and participate in a powerful group energy. Whether you're a beginner or seasoned practitioner, our goal is that everyone leave the studio feeling better than when they arrived. Your safety and well-being is our primary concern. YogaFlex yoga is rooted in traditional Hatha Yoga but is unique in its modern transformational approach to a path toward a more joyful exisitance both on and off the mat. Regular practice can help restore all systems to optimal health and create harmony of body, mind and spirit. You can expect to enjoy relief from chronic aches and pains including headaches, back and joint pain. You will experience improved flexibility, strength and cardiovascular endurance. Many practitioners see an increase in energy and decrease in stress levels in addition to effortless weight loss. The heated environment can often prove to be quite challenging and therefore leads to a greater ability to focus outside the yoga room. Additionally, with excessive sweating comes a wonderful detox which inspires healthy eating habits and life choices. For testimonials, check out our website at yogaflexny.com. Your introductory pass is a great way to check out our studio and the different kinds of yoga classes we offfer. Now celebrating over 4 years in business, the owners of Yogaflex are committed to providing the optimal environment for hot yoga as well as not-so-hot yoga. We encourage you to practice as often as you can. The more you practice, the faster you will see results. Drink water throughout the day. Stay hydrated. Water flushes away toxins and keeps your brain sharp and your body loose. Practice with regularity (at 10 times per month), intention, and intensity. For good results practice 3 times per week; for life changing results, practice more! Arrive to each class at least 15 minutes early and practice silence in the yoga room. Replenish electrolytes: Calcium, Sodium, Magnesium, Potassium. Electrolytes can be found in products like Sustain, Ultima or EmergenC packets, bananas, young coconut water, and sea salt. Eat a healthy snack an hour or two before class so your body has fuel. Good snacks include fruit such as a banana or apple, and a handful of trail mix or nuts such as raw almonds or walnuts. Avoid big, heavy meals before class. Always breathe calmly through your nose in the postures unless otherwise instructed. Your muscles need the oxygen to work efficiently. Never hold your breath or pant (hyperventilate) through your mouth! Doing either of these things robs your body of oxygen. Before any balancing posture, focus on one spot in front of you to center yourself. Then try to increase your holding times second by second. Think positively and do not take yourself too seriously-remember, falling out of a pose makes you human, trying again makes you a yogi! Smile and have fun! In Savasana (rest) between postures, make the most of the relaxation time. Here the blood is most easily circulated through the body, delivering nutrients and oxygenated blood to those areas contracted, compressed, and stretched in the previous asana (posture). Yoga is extremely individual. Please do not compare yourself to anyone else. Move and breathe at your own pace. Take breaks when you need to and water in between postures only (not while others are working on their poses). You can always learn more about us at yogaflexny.com. If you have any suggestions, comments, or requests please let us know. New students are very important to us. We appreciate your willingness to try YogaFlex and look forward being a part of the transformation that awaits you. Remember, the more you practice, the better you will feel. We look forward to seeing you again! Karen and Dana and your Yogaflex family.